fosterIAN (fos-tîr’ē-ən) – an award given for excellence in the theatre that I have witnessed. For a long time, one of my life’s ambitions was to get the word ‘fosterian’ into the lexicon. I always thought it would be an adjective, like Thatcherite or Marxist, but I’ve now come to realise it is actually a noun, and hence we have the fosterIAN awards. And so here we are, at the end of another year where I broke the 300 show mark despite wanting to see less. (I had a very quiet December by my standards at least…) Now where’s the vodka stingers…?! 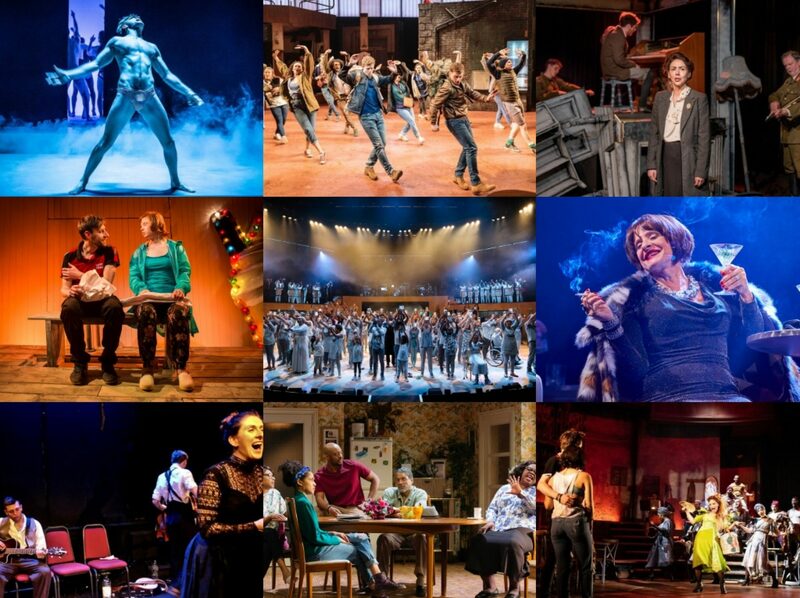 Pretty much everything I want theatre to be, a rhapsodic, true celebration of community. From the joyous riffing on Shakespeare through song and dance to its over-riding spirit of bonhomie, it takes something this inclusive to show you how exclusive so much theatre can be. Sometimes, reviewing can’t help but be personal and Ben Weatherill’s minor-key masterpiece for the Bush touched me incredibly deeply, making me (re)consider so much of my own experiences. It has to come back, it just has to. Marianne Elliott’s production was so much more than the gender-swap that led the headline, the smartness of her adaptation making the work speak to today in ways you might not have thought possible, and delivered by one of the best companies you could have hoped for. I was entirely seduced by the film so the opportunity to finally see the musical was one I wasn’t going to give up lightly, and the trip to Leeds was well worth it, I don’t think I cried in happiness this much at a finale in ages. I’d love for a tour to come back and visit more English venues. It says something that I was willing to go back to what is probably one of the most emotional pulverising theatrical experiences of my life. And the Part 1 finale was possibly even better second time around, the highlight of an exceptional new landmark piece. Coming completely out of left field, this play with songs was a devastatingly moving work that had me completely gripped. I won’t be missing any of Lizzie Nunnery’s shows in the future. On a criminally scorching evening, Out of the Forest Theatre made me forget the heat for a hugely entertaining hour which I could have watched right again then and there. Taking the Dorfman, and then the West End, by storm, Natasha Gordon’s passionate family drama was as educative as entertaining, as well as utterly enthralling by the relevatory final scenes. I booked to see this a second time before I’d even gotten home from the first – it was that enjoyable. Sneaking in at the last moment, this delivered the Christmas message you didn’t know you needed. Brutally affecting. For the second year running, this award goes three ways as apparently I’m a sucker for a women-heavy production (who knew!). But there’s something more here, it wasn’t just about how Harvey, Perkins and Robinson shared the role of the title character in Emilia, its how they supported each other through it as well, reinforcing the play’s cry for the necessity of solidarity. Everyman? Every-Emilia! A deeply empathetic performance from Gordy underscored the undersung importance of this production – her searingly honest Kelly opened the eyes and touched the hearts of surely everyone who saw Jellyfish. Crowding us with love, forcing us to care…Craig’s initial casting as Bobbie garnered all sorts of headlines but once Marianne Elliott’s production opened, that attention was more than justified by a sterling turn from this most versatile of actors (don’t forget she’d only just finished a run in The Ferryman). A strikingly contemporary figure, she both integrated Bobbie better into the ensemble than ever before and made her stand out at just the right moments, ie making sure she got hers from Andy! Given some of the things that transferred into the West End, especially now the Ambassador’s has been freed up, it’s a travesty that Fun Home didn’t get to further its journey (for now at least), especially since it was anchored by a finely nuanced performance from the excellent Hammarlund. A small saving grace is that she’s now free to lead the cast of Violet in the New Year. As Eric Glass, Soller’s sensitively nuanced performance is one of the most crucial in The Inheritance, the development of his humanity and the lightness of his humour goes a long way to sustaining the considerable heft of this two-part epic. A real birthday treat this was, Kesting giving us Sophocles via Icke, effortlessly redefining tragic Greek figures for the contemporary age. Entirely capturing the modern politician’s dilemma about how ‘real’ to be, his dogged pursuit of the truth was as compelling as it has ever been. Musical theatre is so often derided as frothy flights of fancy that it can be easy to be surprised when a performance of real honesty shines through. Miller’s Davy, a bluff squaddie struggling to readjust to life after a tour in the Middle East, captured so much of that magical ‘extraordinary in the ordinary’ quality from his dancing to his singing, as well as his acting, that I could hardly take my eyes off him. I’m not picking Finnigan because he picked me to be his audience hunk (honest) but for the irresistible charm of his effortlessly guileless Liam, the kind of hero you can’t help but root for and exactly the kind of (incidentally) gay characters we need our culture to be suffused with. A peach of a role for this most characterful of performers, Noble fits Aunt Maggie so well the part could have been written for her. And as with Nine Night at large, the beauty is in the simultaneous specificity and universality of the character. Though rooted entirely in Jamaican traditions, she’s also the archetype of the opinionated elderly relative that is recognisable no matter where you come from and Noble imbues her with just enough heart to go along with the hilarity. A late but indisputable arrival, the ferocity with which Plimpton permeates her performance makes an already excellent production into something unmissable. Obviously it helps that she’s an iconic figure from my childhood movie days but seriously, do what you can to see her at the Donmar. A triumphant return to the West End stage for this most iconic of performers whose every mmm-hmm turns another theatregoer into a homosexual. Every time I’ve seen the show, her interpretation of ‘Ladies Who Lunch’ has brought different colours and textures – and check the moment when her eyes pin down Bobbie with “the girls who just watch”. Plus she does furniture-shuffling choreography like a real trouper – a privilege to watch (and watch again). I’d thought LuPone would walk this category but the elemental force with which Gray blew onto the Olivier stage had me in raptures as her every move and utterance had me absolutely gripped. Is there any way we can keep her in the UK or entice her back as soon as possible please. How many times and in how many ways can the same man break your heart? Hilton is exquisitely, agonisingly, pitch-perfect in The Inheritance no matter who he is playing, a much needed voice of experience in among the tight, bright young things, an unforgettable, powerfully moving tribute to generations lost. I’ve long been a fan of Masson’s, going back to seeing his hysterical musical Stiff! back in my uni days, so it was great to see him as such a vibrant and vital part of the ensemble in this Rebecca Frecknall production, standing out as a pair of patresfamilias. Done well, ‘Getting Married Today’ is a highlight of any production of Company but here, making Amy Jamie works an absolute treat in showing both how far we’ve come and how little there is between us all when it comes to gay marriage. Partnered perfectly with Alex Gaumond’s patiently lovestruck Paul, this vignette becomes even more heart-breakingly, soul-raisingly fantastic. Between de Shields getting the party started with his twinkling charm and Page’s basso profundo doing all sorts of things to me, I couldn’t split these two on the way down to Hadestown. Flashes of excellence can be found in the midst of any production so this list celebrates some of those breath-taking and/or memorable moments that really made theatregoing enjoyably fun this year. For reference, here’s my 2017 list, 2016 list, 2015 list and 2014 list. As I live and breathe, we made it! Behold the 2018 fosterIAN award nominations, recognising the acting performances that stood out for me, the ones that made me sit up, and sometimes stand up. As ever, I have used the label ‘best’, the categories should really be considered ‘favourite’ as that is what the fosterIANs (fos-tîr’ē-ən) are – my favourites out of the 300 or so shows that I saw. Results to come in the next couple of days.